Here’s a photographic proof that indeed I have ‘come out’, in what now seems like a small way. Like our maths teacher said when we returned for a new year’s studies after passing ‘school Cert’: ‘Congratulations on stepping over the matchstick.’ Meaning the current year was when the real learning would have to begin. He was actually a good teacher, but blunt. He told me once after a particularly strange question (the import of which i forget), ‘Seer clear of the idiot fringe, Harris. Stick to the middle of the road.’ Advice I should have followed, some would say. I might have become a maths teacher like him, instead of a ‘wizard with no visible means of support’. Well, it is Spring. Now for the real work. 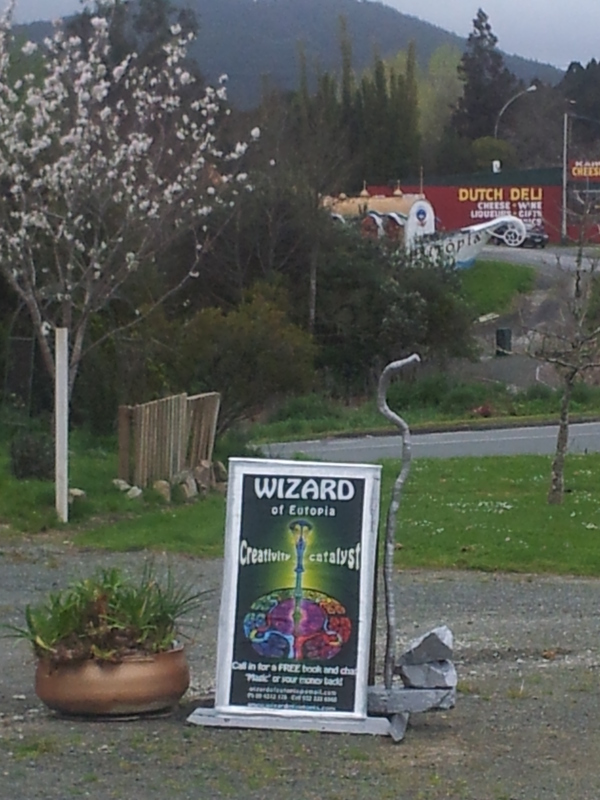 Sign needs work too (note the staff of willow – needs a lamp or similar…) But not right now! The thing is to keep the Main Thing the Main Thing. As the late Steven Covey said. 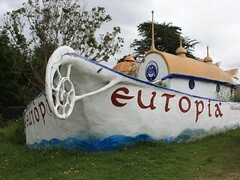 And when I do a better one it will probably be the ferrocement ship’s prow like the Cafe Eutopia one in the background. now that WOULD be a sign! thanks! if they see it they will know what to expect!